According to online dictionary, the term "hooded eyelids" means having heavy eyelids that appear to be half closed. Here's the most simple steps that I've done, feel free to use your own eyeshadow shades, in this tutorial, I picked my newest Bobbi Brown Rich Caviar Eye Palette as it has all the shades I need to create this eye makeup! Pick your favorite eye primer (that's crease-proof and smudge-proof). Dab eye primer on your lids as this will not only make your eyeshadow look more intense but it can hold your eye makeup in place thus preventing "Panda" eyes. In this step, AMW is using Etude House Proof 10 Eye Primer. Since hooded eyes have this small fold of skin that hangs over the socket line, it is quite impossible to have a natural crease area so you have to create one! How? Pick a makeup brush and use the handle in gently pressing the handle over your eyes finding the space between your eye socket and brow bone. Using any matte colored shadow that's a shade or 2 darker than your lid color (make sure not to pick shimmery or super dark eyeshadow shade as the effect will turn out dirty!). Pick up your favorite crease/blending brush and gently sweep the color on the "fake crease". I am using Wheat Eyeshadow from Bobbi Brown Rich Caviar Eye Palette with Charm Essentials Vegan Crease Blending Brush. After creating a fake crease, feel free to pick any shimmery or bright colored eyeshadow and sweep it all over the inner corner of your eye. This step will create an illusion of bigger lid space. In this particular step I am using Candlelight Metallic Eyeshadow, from Bobbi Brown Rich Caviar Eye Palette with the flat shader brush that comes with the palette. 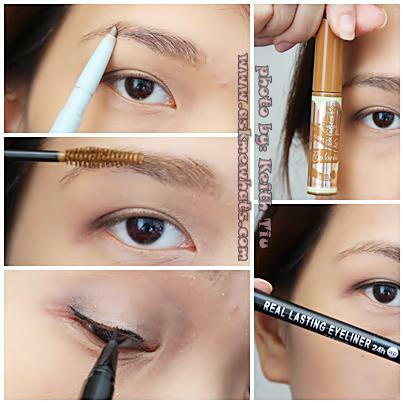 Now is the best time to "deepen" that fake crease you've created. Again, keep in mind to make your shadow application neat and clean by applying less then packing on pigments as needed. Pick a dark, matte eyeshadow (either brown, black or dark grey) and gently apply it on the outer-v as illustrated on photo below. Keep in mind to stop and open your eyes once in awhile and check your reflection in the mirror to make sure you don't go beyond the "v-shape". For step 4, AMW used Rich Caviar Eyeshadow, from Bobbi Brown Rich Caviar Eye Palette with Charm Essentials Vegan Pencil Point Brush. Just when you think you're tired from all the eye shadow application, do not worry, this is the final step to a brighter, uplifted eyes! Pick any eyeshadow shade close to your skin tone or probably a shade lighter, apply it on your brow bone area, or in your case, the "hooded part of your eye". Again use matte colored eyeshadow on areas you don't want to pop! Using shimmery eyeshadow shades in this step will make your heavy lids appear more prominent. Not on photo illustration: Curl your lashes and apply coats of your favorite mascara. Pick a mascara that has a good holding power in terms of curl. A curled lash will make your eyes appear larger and brighter. Be very gentle in terms of eyeshadow application. Never apply dark eye shadow shade all over your lids as it will make your eyes appear dirty and uneven. Be very careful in terms of using shimmery or frosted eyeshadow shades. These shades are used to "highlight" specific features. SMILE! Come on, that's the best face-lifting method that's free! Do you suffer from hooded lids? Any other tips you can share for our readers out there? As for me, my left eye is a bit hooded and I can't seem to find the crease as compared to my right eye. I use this method to even out both my eyes and so far, it works! As for clients, mature people aren't the only ones suffering from hooded lids, even young clients do have it! Ah Anastacia, i can still remember your eyeshadow looks and you definitely know how to work with your eyeshadows!